Or simply, “The Best Thanksgiving Appetizer”. And that is not an exaggeration. Promise. These are the best. Well, because there is tons of gooey melted brie cheese. Brie should always, always be added to nachos from now on. Guys, it is crazy good and they are nachos so they can be put together in very little time. These are a real winner. Just sayin. And please, please, please do not get scared off by the brussels sprouts. Seriously, they get so caramelized and loaded with cheese that it is hard to tell they are there. And to be honest, if you really dislike them you can leave them off. But I did serve these to my brussels sprouts hating mom one afternoon and she went crazy for these. It’s the brie. I think it is kind of magical. But there is not only just brie. No, there is actually three cheeses. I know, three!! This excites me greatly. Oh, and speaking of cheese, have you guys entered my Wisconsin Cheese Basket Giveaway yet? You really need to do that. It ends Sunday and man oh man it’s a good giveaway. You get an entire holiday cheese basket shipped to your door. I also made homemade cranberry molasses to drizzle over these guys and wow. The stuff is good and super easy to make. I could drizzle it on everything! 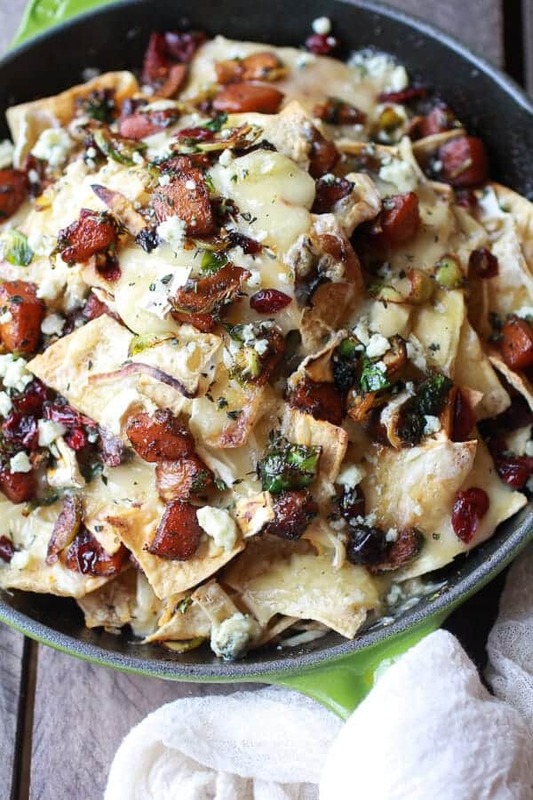 These nachos are the perfect thing to serve as a Thanksgiving (or Christmas!! Just look at those gorgeous red and green colors!) appetizer. 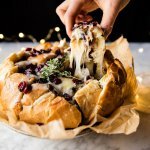 They are pretty, delicious and loaded with cranberries and brie. Which in my mind is a Thanksgiving staple. You just have to have brie and cranberries during the holidays. You just have too. 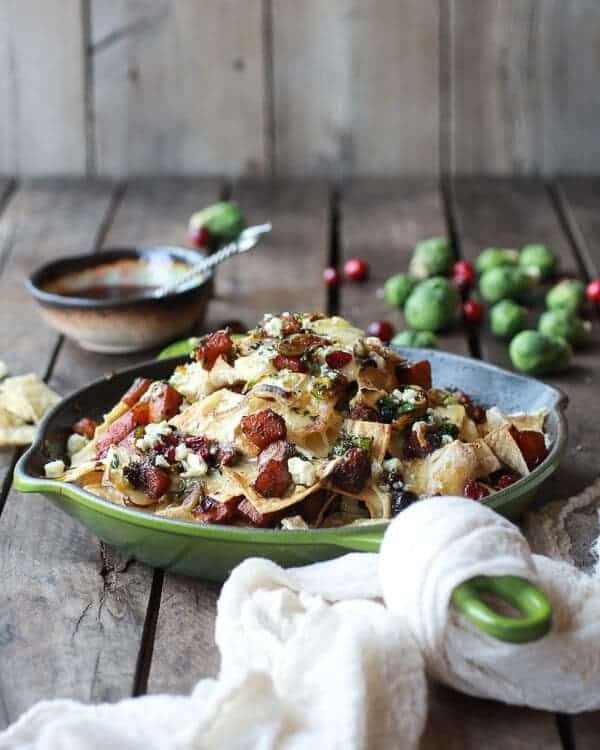 I have had the idea for these nachos in my head since mid October, but I held out so I could make them closer to the holidays. Finally the time has come to share them. 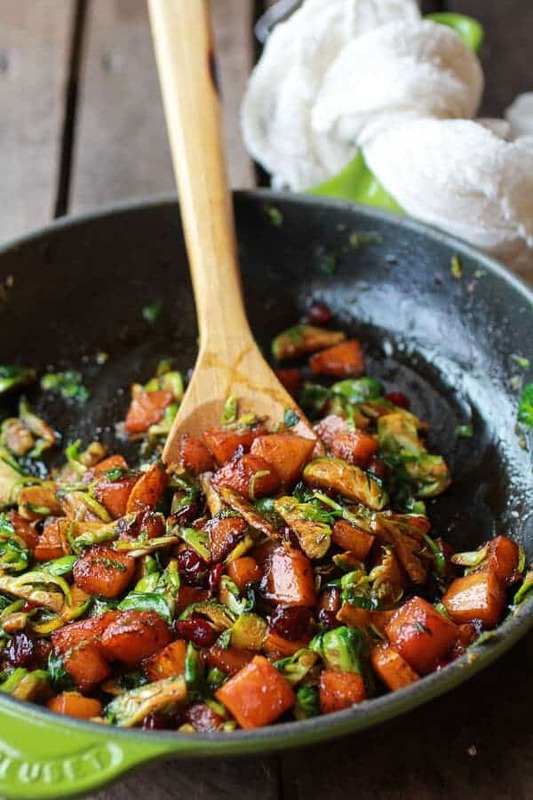 First, you need to caramelize the butternut squash and brussels sprouts. It’s what makes them so delicious and so perfectly sweet and savory with the brie. It really just works. Then you throw in some spices to balance the sweetness and add the cranberries in the last few minutes of cooking to liven them up a bit. Pretty simple stuff, but still so awesome. Oh, and you only have to dirty one dish! Holy heck, yes! After you get the veggies caramelized all you have to do is layer on the goodness and melt, melt, melt melt! Oh, and there are loads of veggies in there, so these are totally healthy. And I am totally in love. 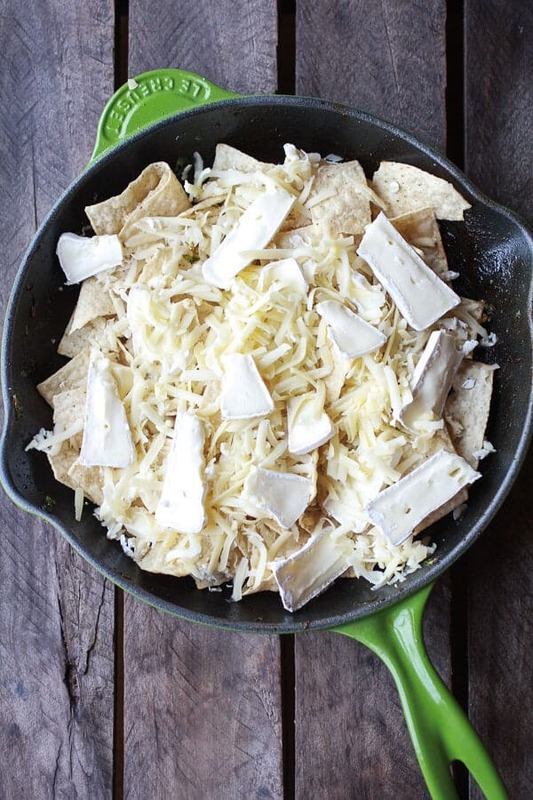 FYI, melted brie and tortilla chips is probably one of the best things ever. You’ll see. I didn’t know you were having a giveaway. Where do you enter? I looked but didn’t see it. I would love to win. My husband would have a cheesy time. Hehe!! I live in a small town and cannot find pure cranberry juice @ the grocery store. Where does one get it? oh. my. goodness. These will be making an appearance at our house soon! Wowza, thanks so much! I love the way your mind works! 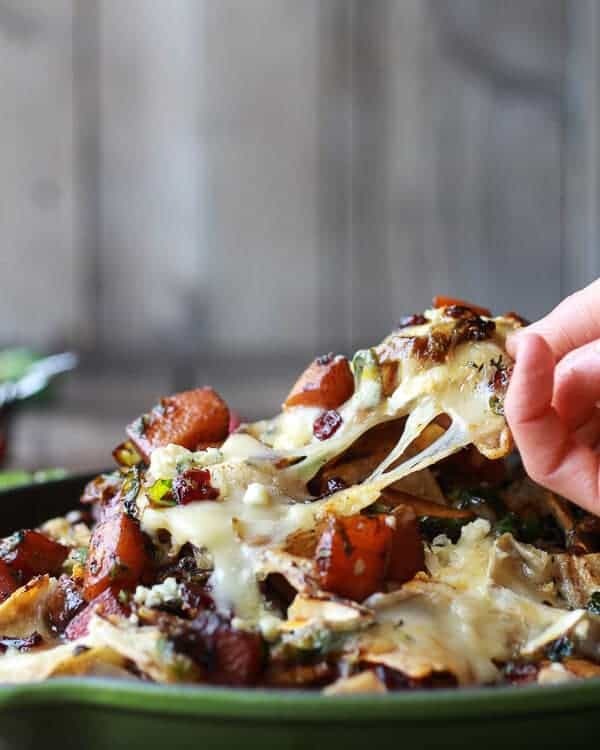 I actually love having nachos with friends and family around the holidays, it’s a great way to join everyone together! Oh my gawd!! This is the best Thanksgiving dish I’ve seen! I’ll just have this and pie! This looks amazing! What a great idea! I have got to try this! Looks insanely unique and delicious! These nachos are insane! And that cranberry molasses? I kinda want to pour that on pancakes…would that be weird?? Love these pictures, Tieghan! WOW Tieghan!!! 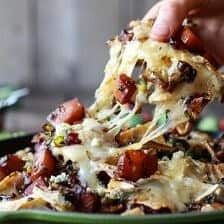 What a great take on the flavors in baked brie, It is like a deconstructed baked brie, you really are a super genuis! Omg. WHAT. This is definitely the best thing ever! I was convinced by just the words ‘brie’ and ‘nachos’ but then it just kept on getting better! omg there are not enough words for this! I love every single aspect of these nachos..I just want face plant into that skillet. Brie for life. Other than WOW – I dont know what to say! I need to make this! 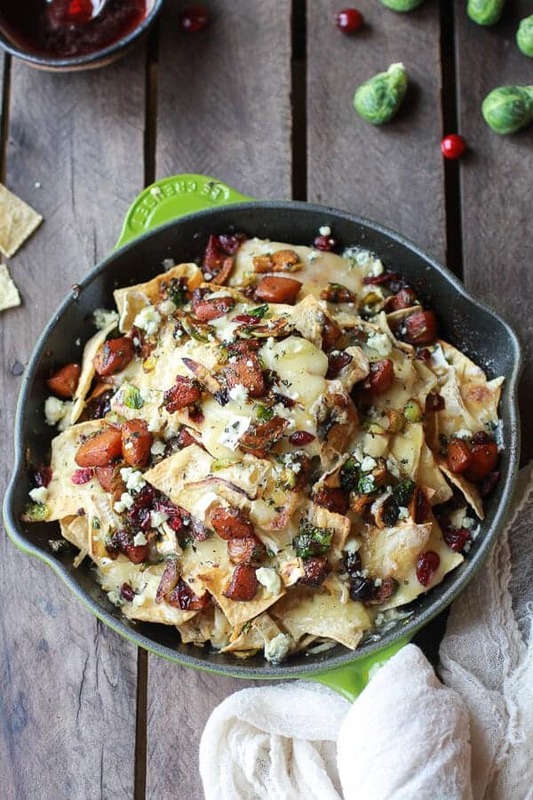 “Brie should always, always be added to nachos” <– yes!! These look incredible! It's only 9:15 am but I'm pretty sure I'd inhale these if they were in front of me! Ha! Thanks so much, Laura! 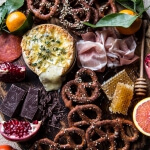 The Best Thanksgiving Appetizer? I believe it! Let me just ship your trophy right over :-p My family all has this weird preconceived notion that brussels sprouts are gross — and they’ve never even tried them! I think there’s enough going on here that I could get them to sample without knowing the brussels even exist and convert them into sprout lovers forever! 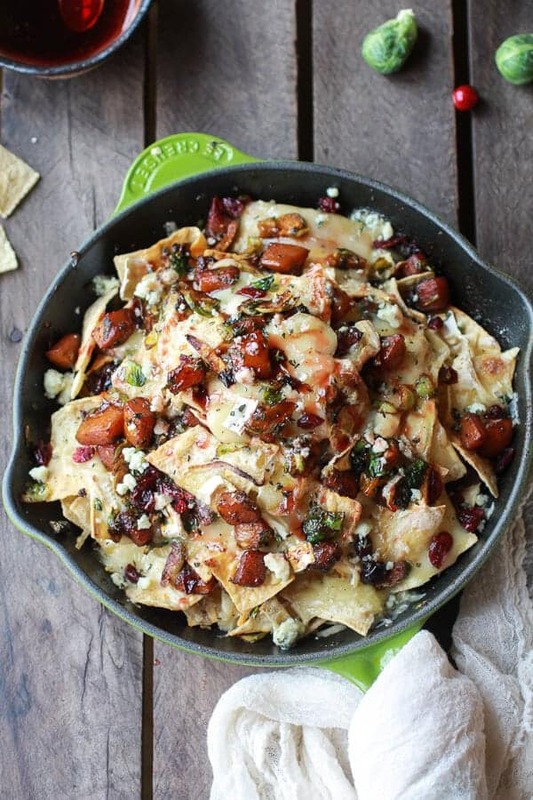 What a great way to celebrate Thanksgiving with NACHOS! 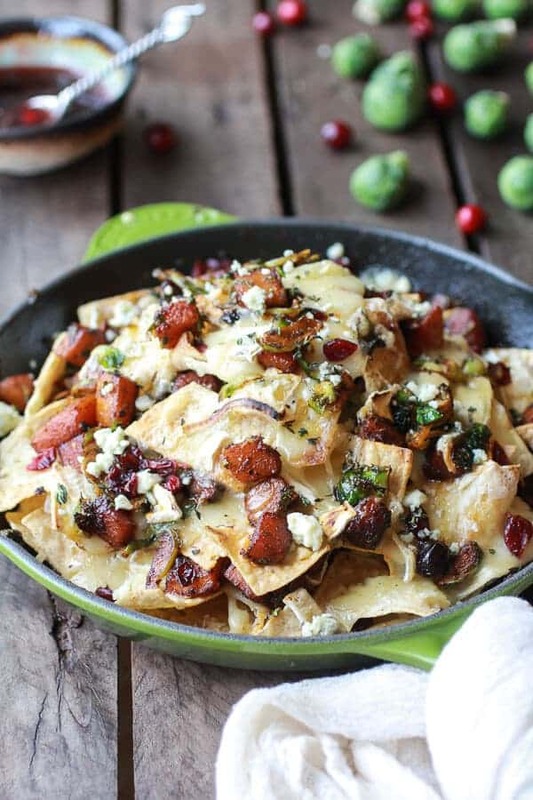 Out with the simple and in with these nachos! I never have time to experiment with new finds this time of year. However, I am making an exception. This looks and sounds delicious. Awesome dish. Thank you so much for sharing. Happy Holidays to you and yours. BRILLIANCE! Any brussels sprouts hater would love this dish, I’m sure. And all that cheese is so swoon-worthy. Thanks Abbie!! I agree, any brussels sprouts hater would love these! You amaze me every day friend!! This looks freaking killer! This dish must be perfect for parties. For example any time when my friends are coming to watch film together I always make such dishes which are very convenient to eat even without plates! And they are really fast to cook. It’s and they are fun to eat! Thanks Maria! Awe!! Thank you so much, Stacy! It means so much coming from you! Oh wow! I want these in my mouth right. NOW!!!!! Amazing!! What an inventive flavor combination and way to use it! I can imagine these were out-of-this-world! I think I’m in looooooooove! What a yummy (and incredibly interesting!) looking skillet!! YUM! Question: Do you cut and pick up with fingers? Thank you…looks great. Hey Marry! Yup, I just had everyone use their hands to pick these up, but if you want you can cut them up and serve them on plates. Hope you love these! These look amazing!!! So full of all my favorite fall things! Never mind appetizer, I would choose these as my main course over turkey any day! These look amazing, Tieghan! No that is a compliment!! Thanks Meghan! I made these last night. Wow!! It was my dinner. They are delicious!! YAY! So glad you loved these! Thanks Sharon! That looks amazing! What an excellent thanksgiving apetizer! We made these last week, and my husband and I devoured pretty much the entire thing. Thank you so much for an amazing recipe. I never would have thought to mix all of these flavors together, but this dish was perfect! Can’t wait to make it again! 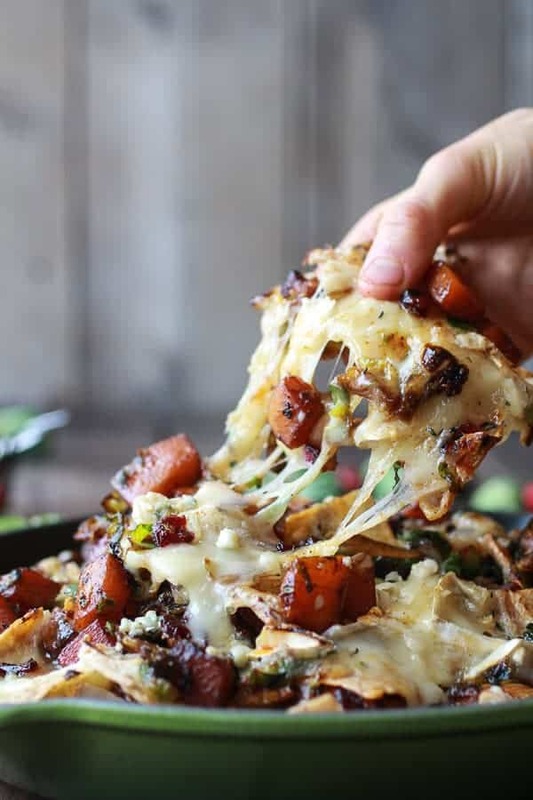 We just made it again, but this time put the whole mess on pizza dough instead of nachos. Delicious! My friend and I made these to enjoy while watching the Oscars. We substituted sweet potatoes for butternut squash–the flavors were amazing and SO CHEESY. Thank you! Oh so happy you guys loved them!! Thanks! i made this over the weekend for a friends dinner party and KILLED it. this was SO good, and gave me a chance to use my 60+ year old cast iron skillet. everyone raved about how good it was, i may have even insulted the host over all the comments. Holy Amazeballs was this good! 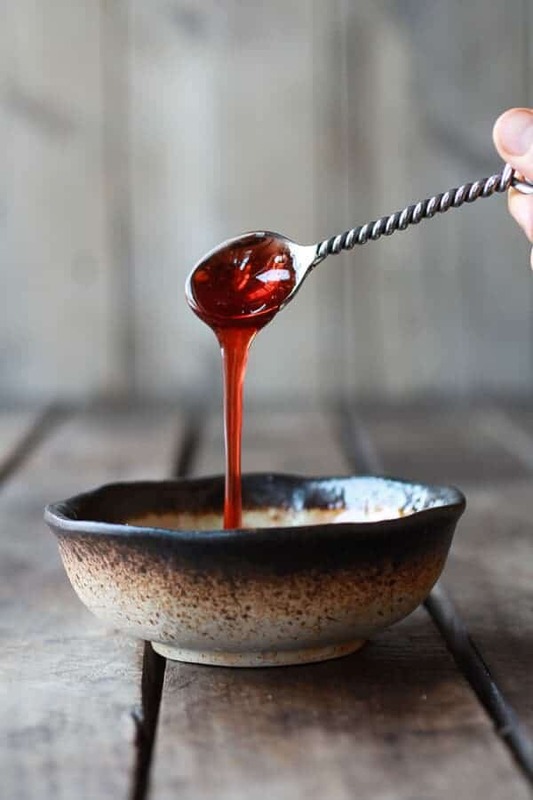 Definitely do the gooey glaze/sauce, it’s fantastic! Only thing I added was some blackberry jalapeño pulled pork I had made earlier, a very nice addition if you aren’t trying to do just veg. Great recipe, thanks! I am so excited you loved these nachos! Thank you! I have made these at least 4 times now, the only change I made was using fresh cranberries when they are in season and they are perfect every time! You are a genius for coming up with these and everyone I know thanks you for it! I must have sent at least 10 people to your site to make these for themselves. As for me, I am making this dish for lunch for those of us cooking on Thanksgiving. That is so awesome!! Thank you so much for sending all your friends my way. 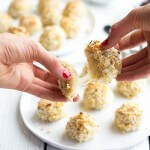 I am thrilled you love this recipe. Have a great Thanksgiving! We had these this past Christmas, and everyone immediately decided they’re a new tradition! Also, I asked my husband to make these for Valentine’s Day dinner – we have a newborn, so there was no getting out. But, no matter – it was delicious! These have become my new favourite! Can I ask you where you got the spoon you were using in the pictures with the syrup for the nachos? Or if you know the manufacturer? I have bought pieces of the same utensils and can’t find them any more….. Some details would be much appreciated. HI Suzanne! I bought those a long time ago and if I remember correctly, they are from Crate and Barrel, but I do not see them on their site anymore. Let me know if you have questions! Sorry I could not help more. First off, I LOVE this recipe I have made it twice. Second, I did tacos instead of nachos because I didn’t have chips but had corn tortillas. Also I still haven’t been able to find pure cranberry juice, any suggestions? Hey Katy! So happy you love this recipe! You can use pomegranate juice or maybe another fruit juice? that is so weird you can’t find cranberry juice. So sorry! Let me know if you have other questions. Thank you! This looks and sounds amazing. Do you think it would ok to carmelize the veggies and then refrigerate overnight? We travel 1 1/2 Hours for dinner. Would like to put together there and bake. Wow this sounds YUMMY!! Want to take to work for others to try.Any suggestions on how to keep chips from being soggy? 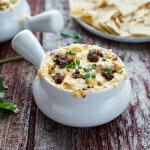 Or can I put all ingrediants in a crock pot once melted, and leave chips out for others to scoop cheese.etc…on? I made this for a Christmas gathering with family. I used a crock pot for everything but the chips. The only comment I would make is that the “blue cheese” is pretty strong and maybe don’t use as much. But than again I don’t like blue cheese!. I also did not have any luck with making the syrup with the cranberry. It was too thin. I will experiment with this again. I hope you enjoy this more the next time you make it! Thanks Anne! Also, you mention slicing Brussels sprouts thinly, then say shredded. Can they be shredded in a food processor, instead of trying to slice. Am having difficulty thinly slicing. Would like to be entered into your cheese basket contest too. Hi Helen, right under the title there should be a row of options to share it. The email icon is all the way to the right. I hope this helps! Let me know if you have any other questions. I made these Saturday and they really were amazing! Next time I will double the amount of vegies on top, especially more brussel sprouts! Even a little chicken would be fantastic on these! Fontina is a must! My husband and my 16 year old son were skeptical, but they loved them as well and the nachos were demolished. Wow I am so happy to hear that Rebecca! Thank you so much!